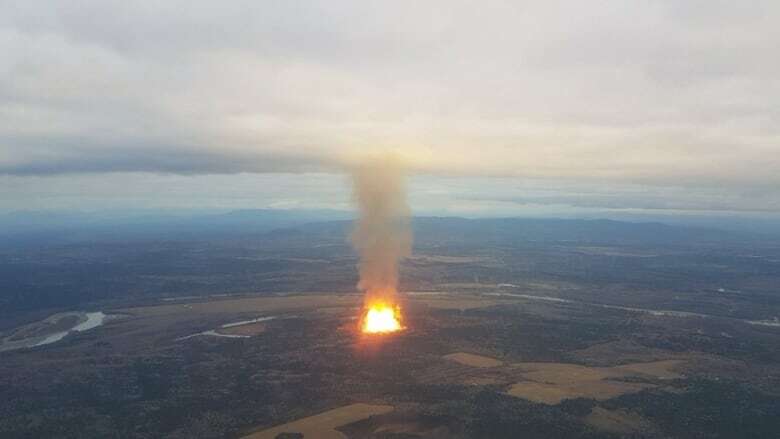 FortisBC is warning customers that the gas pipeline explosion earlier this month will reduce natural gas supply between 20 and 50 per cent of normal levels going into the winter. "The natural gas system will be challenged in times of high demand throughout the winter," a statement from the energy company warns. FortisBC is asking all British Columbians to conserve energy wherever possible. The news comes after an Enbridge pipeline exploded and caught fire northeast of Prince George on Oct. 9. The cause of the explosion is still unknown. Enbridge has said it expects the ruptured 36-inch pipeline to be repaired and in service again by mid-November, but Fortis says both that line and another 30-inch pipeline will only be running at 80 per cent of capacity throughout the winter. FortisBC said it is working to make more gas available. "We've worked with TransCanada to maximize output of the Southern Crossing pipeline that feeds into the Interior from Alberta and are actively working with industrial customers to optimize their energy use — keeping them running while minimizing system impacts," said the statement. The energy company said it would also be working to secure more natural gas in the open marketplace. FortisBC CEO Doug Stout said he's "hoping the 50 per cent scenario doesn't unfold." "Depending on how weather goes through November … we will have to manage gas demand as best we can here to fit into that supply that's available," he said. "It becomes, really, a week-to-week exercise in planning and forecasting." FortisBC asked customers to cut back on their natural gas use in the immediate aftermath of the explosion, and asked industrial customers to use alternative fuel sources. Those original cutbacks were significant, Stout said, but the utility is encouraging people to continue conserving energy as the timeline for repairs becomes more clear. "People conserve — and then they kind of slide away from it. So that's why the continued messaging here is to keep it up," he said. "The furnace is still off at my house, anyways."